I had a great time over this past weekend being a part of This is Twisted Theatre's first episode of 2012. The cast is a fun group of people, who I really enjoy the company of, and the performances showed a fantastic balance of what each of us can bring to the table. My weekend wasn't short of a freak out though. I have been dealing with sporadic back aches, lower back aches. Those who are tall can relate I'm sure, and I'm not about to blame my heavy instrument of choice on this lower lumbar problem. I got these aches before playing full time anyways, so I blame my height. Pretty scary though, to feel so disabled suddenly and every movement hurts. Stress brings it on I believe, as this happened my first week into rehearsals at Disney. I nearly lost my mind when my back went on me, "NOT NOW, BACK!!". Ya. Posture is a huge thing for musicians. I learned how to sit up straight during the years of classical piano lessons I took, elbows are at your side, and wrists lifted off the keys and fingers creating a cage - or that's what my teacher taught me. In the mind of a child it worked. Make your hands into a tall cage so that all the zoo animals can fit inside. 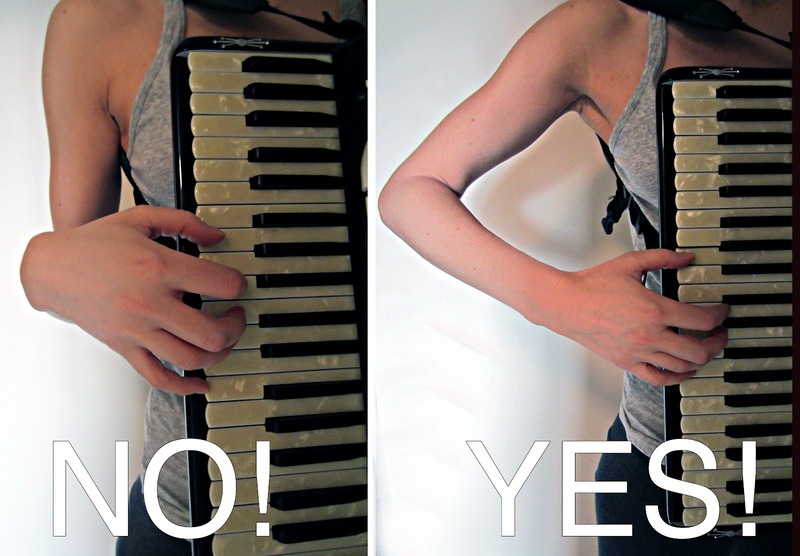 Things are similar for the accordion. Sit or stand up straight, take up plenty of room with your arms, have a good pair of shoulder straps - otherwise your neck and back will hate you, make sure the straps are positioned properly so that the accordion is strapped to your body for you to play with the most ease, the keyboard should be inline with your head, and when playing the keyboard with your right hand - play with the control from your elbow goddammit - not your wrist. You're going to hurt your wrist in the end, and you don't have the right amount of control over the keyboard as you do when you pivot from your wrist. I'll stop scolding now. 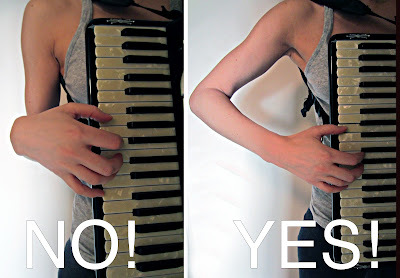 I only scold because I see far too many new accordion players unaware of the basic playing/posture techniques. Alright, back to what I love to do: PERFORM! There are plenty of stories about the Accordion Girl lost in Orlando, and with her ears of enlightenment she shares these stories.